This tutorial focuses on Behaviour Driven Development, Dependency Injection and application design in general. The primary technologies being used will be SpecFlow and MS Test. While we are targeting the .Net platform the content is applicable to most object oriented languages. Behaviour Driven Development (BDD) is an ‘outside in’ or ‘top down’ development approach. Development starts from the user interface downwards as opposed to starting with the database design. When there is no user interface (as in the beginning of this tutorial) we work from the highest level possible. BDD encourages thin slices of work. Where we break features down into very small ‘end-to-end’ pieces of work. This work is expressed in the form of examples. This is known as specification by example and we will see this in the tutorial. 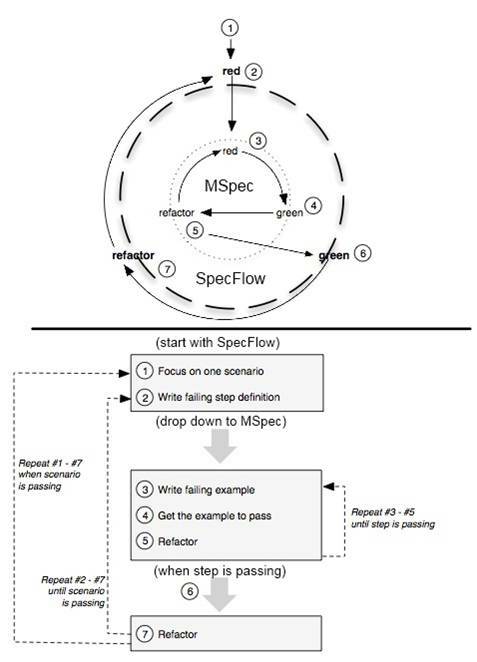 In SpecFlow speak, each example is known as a scenario. We need to implement a number of scenarios before the feature is considered complete. We will flesh out the design as we implement each scenario. As depicted, there are two levels of testing – high level system or integration tests and lower level unit testing. The high level tests often drive a user interface and may be referred to as automated acceptance tests. Not only will we be following the BDD cycle, but we will only implement the code we need to make the existing tests pass – and no more. We will be very strict with this. This may seem tedious to some however this approach is good to practice. You can always fall back to this approach should you become stuck when writing production code. Interestingly TDD was always meant to have multiple levels of testing. In Extreme Programming Explained, Kent Beck and Cynthia Andres have the following to say about architects: “Architects on an XP team look for and execute large-scale refactorings, write system-level tests that stress the architecture, and implement stories”. This is similar to what we are trying to achieve in BDD. In fact Dan North introduced the term BDD to help him explain TDD to developers. This is why I say that BDD is TDD done properly. These days it is common to hear teams say they are doing “TDD but not BDD”. By this they sometimes mean that they are writing system tests and unit tets, but they are not using a “BDD testing framework” like Cucumber or FitNesse. There is nothing wrong with this approach. Sometimes “we do TDD but not BDD’ means that the team members are not writing system level integration tests. This is better than no tests at all, however it is not true TDD and they are missing a trick. James Shaw does a great job of explaining Dependency Injection (DI). He points out that “Dependency Injection means giving an object its instance variables”. The instance variables are typically reference types which provide a layer of abstraction. We can give an object it’s instance variables through a number of different ways namely constructor injection, property injection, method injection. There are many reasons for using Dependency Injection. The most obvious reason is that it makes the code more testable. It makes it easy to use mock objects in place of the real dependencies during testing. Testability is not the only reason, when done properly code which uses dependency injection tends to support the SOLID design principles, most notably the Single responsibility principle and Open/closed principle. This will be shown in the tutorial. Dependency Injection is a simple concept, the confusion seems arise when Dependency Injection containers enter the discussion. For this reason I will not use DI Containers for the first few parts of this tutorial. All I will say is that DI Containers may help when composing objects, however they are not required to implement the dependency injection pattern. When I began playing cricket at school, the coach instructed me to change the way I gripped the bat. At first the new grip seemed strange and uncomfortable. After many practice sessions I began hitting the ball further with more accuracy while using less effort. When I adopted TDD I went through a similar experience. I first felt discomfort and frustration but after practising the technique I found I was achieving better results with less effort. In this tutorial we will build a Rock Paper Scissors game. We will focus on building a library that can be used with any front end e.g. a console application, WPF etc. Part 1 covers the solution set up and the basics of SpecFlow. In this first section we are cover the set up and we get used to the BDD cycle. There is no dependency injection in this part, we will move onto that and more interesting topics in part 2. I will not spend much time explaining SpecFlow, we will get the hang of it as we go. Firstly download and install TechTalk.SpeckFlow. We will also need the latest version of Moq. We begin by creating a new project in Visual Studio. Select a Class Library (C#) template. Name it RockPaperScissors. Class1 can be deleted. Add a new project to the solution. 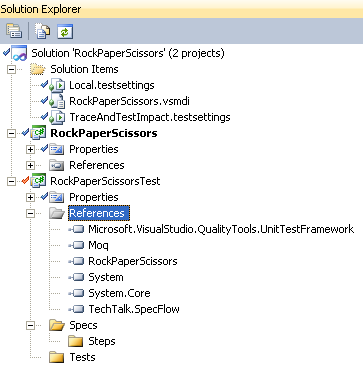 This should be a Test Project (C#), call it RockPaperScissorsTest. UnitTest1 can be deleted. Add the two new folders called Tests and Specs. Then add a ‘Steps’ folder under the ‘Specs’ folder, see image below. The Tests folder will contain the unit tests, the Specs and Steps folders are used for SpecFlow tests. Add a reference to the latest version of Moq, TechTalk.SpeckFlow and the RockPaperScissors class library. Then the result should be "Player Wins!" This contains a Feature and a single Scenario. The Feature is the user story. The Scenario forms a part of the specification, see specification by example. Next we map the feature file onto code. This is done by adding a SpecFlow step definition file. Add a step definition file to the steps folder and call it ‘PlayRoundSteps.cs’. Delete all the sample steps. It is possible to run the SpecFlow tests by right clicking on the feature file and selecting ‘Run SpecFlow Scenarios’. When using Cucumber, the steps are generated with a comment similar to “Now enter the code you wish you had” – and that is exactly what we need to do. The ScenarioContext is used to share objects between steps. At this stage the code cannot compile as we don’t have a Game class. Next we create this class in the RockPaperScissors assembly. Next we add the required method. Now the code should compile and running the tests will throw a NotImplementedException. To fix this we drop down into unit testing. At this stage we are duplicating the SpecFlow test in the unit test.There is little benefit at this stage. We are simply following the BDD cycle. Experience has taught me that it is better to introduce unit testing sooner rather than later. It is easier to remove redundant tests than to introduce unit testing late in development. The unit test should fail. Then we make it pass by adding the simplest bit of code we can in the Game class. That should make the unit test pass. We then run the SpecFlow test, and that should also turn green. At this stage I am not that interested in a complete implementation of the games’ rules, I am trying to flesh out the architecture. We know we are nowhere near a complete solution, but we do have our first scenario passing – progress! Then the result should be "Computer Wins!" This unit test should fail, similarly to the integration test we wrote using SpecFlow. We now have a total of 5 tests passing, three unit tests and two SpecFlow integration tests. There is still a lot more to be done, including refactoring the SpecFlow tests to use the table feature. In upcoming posts we will see more of SpecFlow and we will use dependency injection. Please let me know of any mistakes I have made, and any topics you would like to have covered in the follow up posts. This entry was posted in Agile, BDD, C#, Extreme Programming, TDD, Tutorials, XP and tagged BDD, csharp, dependency injection, specflow, unit tests, XP by darynholmes. Bookmark the permalink. Thanks for the comments Clair. I am away for 2 weeks, so it may take about 3 weeks before the next post. Wich is causing an error because DescissionEngine is not implemented. Shoul I just remove it or have you/I missed some detail? Rcdmk, I am glad you are enjoying this. I will make time to post more on this topic. I think I was getting ahead of myself, please use the default constructor. This has now been fixed in the post. How come I am getting this error: The type arguments for method ‘TechTalk.SpecFlow.SpecFlowContext.Get(string)’ cannot be inferred from the usage. Try specifying the type arguments explicitly. Try this it will work. @astrology and @Nimish what was the change? You mean replace a literal, quoted string with a string constant? I don’t see how that would make the error go away?